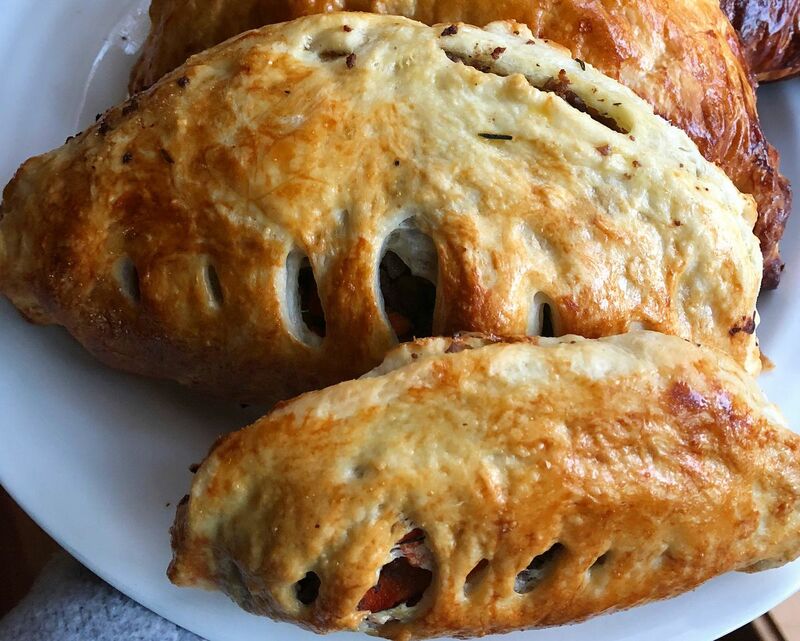 My good buddy Jake has British roots and the other night when I was planning to make him dinner, he requested I make pasties, or British-style meat pies. I wasn't going to do it, because it just sounded hard, until I started to look at recipes and realized I had all the ingredients right in my kitchen. Almost every single one came from Alaska, except for the bison, which I got at Costco. (Costco shopping is something Alaskans tend to excel at, though, isn't it?) And the pastry dough came from the Walmart refrigerator case (and is in most grocery store freezer sections) because, guess what, I draw the line at making pastry dough on a weeknight or, honestly, any night. And I don't feel guilty about it AT ALL. This recipe is SO EASY it's almost not a recipe. And, like all the Alaska recipes I write, it's totally ripe for substitutions. You can use just about any ground meat, including a mix of sausage and wild game, which would be pretty ideal. And the vegetable mix is flexible, too. HOT TIP: If you buy frozen pastry dough, you have to let it thaw for 40 minutes, so plan ahead. Oh and PS: the "past" in pasties is pronounced like "past" as in past lives, not like "paste." That's a whole other thing. Preheat oven to 400°. Line a rimmed baking sheet with parchment. Brown the meat and set aside. In the same pan, sauté onion or shallot with all the other vegetables until the hardest ones are no longer firm, about 8 minutes. Mix in ground meat, thyme and give a very generous treatment with salt and pepper. On a sheet of parchment, give the pastry dough a light roll. Using a round object, like a saucer or small plate, cut the dough into circles. Lay the circles of dough on the baking pan and spoon filling on half of each circle, leaving room around the edge of the meat side. Fold the dough over to cover the filling and crimp the edges together. You can re-roll the dough scraps and make an additional pasty or a couple baby-sized pasties, which kids love. Using a sharp knife, carefully slash vents in the top. Brush with egg. Bake for about 15 minutes or until the pastry is fluffy and golden.